An attractive pictorial map of Paris highlighting the city's many iconic buildings, including the Eiffel Tower, the Louvre, and the Arc de Triomphe. 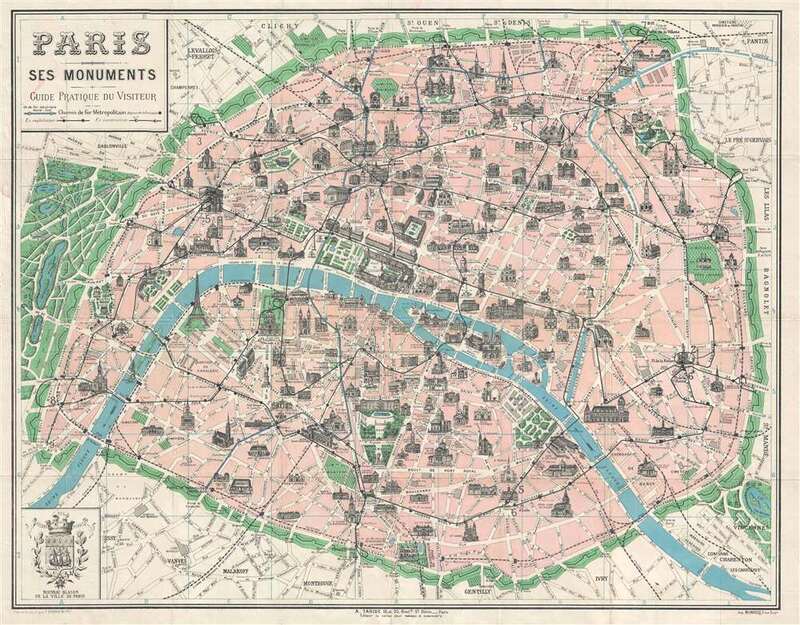 This is an attractive c. 1925 pictorial tourist pocket map of Paris, France by F. Borremans. The map depicts the city of Paris from Bois de Boulogne to Bagnolet and the Bois de Vincennes and from Porte de la Villette to the Park Montsouris. Parisian landmarks, including the Louvre Notre-Dame, the Arce de Triomphe, the Eiffel Tower, and the Opéra, are all illustrated in profile, as are numerous others. Parks, are colored green, allowing them to stand out as the oases of urban life that they are. Myriad roads are also labeled, and the city's Metro lines crisscross their way throughout the city, allowing Parisians easy access from one side of the City of Light to the other. Though undated, a date can be approximated based one the development of the Metro system (specifically Metro line 9 and Metro line 7) and the map's overall style and construction. This map was drawn and engraved by F. Borremans, printed by Monrocq, and published by Alphonse Taride of 18-20, Boulevard St. Denis, Paris. F. Borremans (fl.c. 1900 - 1910) was a French artist and engraver active in Paris at the beginning of the twentieth century. Little else is known about his life and career. Alphonse Taride (fl. c. 1850 - 1918) was a prolific Paris based publisher active in the late 19th and early 20th century. Publishing as "A. Taride", the firm produced a large corpus of work including numerous maps, tourist guides, histories, and pocket plans of different parts of France. With the advent of the automobile and improved roadways in the early 20th century, the name "Taride" became synonymous with high quality roadmaps. Taride had his offices at 18 - 20 Boulevard St. Denis, Paris. Very good. Verso reinforcements and repairs to fold separations and at fold intersections. Small area of infill along left border. Blank on verso.